I love gifting great Learning Toys For Toddlers. This year, whether for the holidays or just as an addition to your home classroom or toy bucket, this list of ideas is ideal. They help to develop such important toddler skills as hand-eye coordination, small muscle development, fine motor development, color recognition, and number identification. I love grabbing items like this when possible and adding to our toy basket for the kids to use and have on hand whether as a gift and special treat around the holidays or to have on hand for everyday preschool and play time. This post contains affiliate links. Purchases made through these links may pay me a small commission. I may have received free product in exchange for review of some products mentioned within this post. 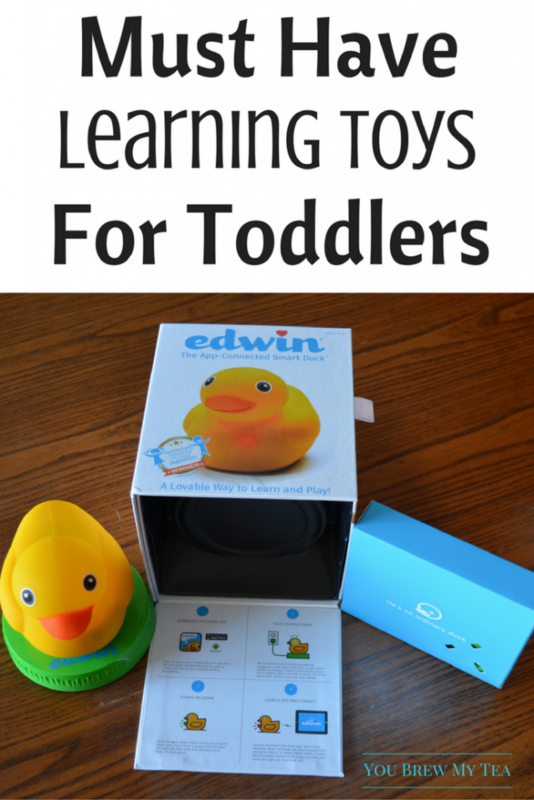 Having learning toys for toddlers and even for preschoolers on hand is a must in our house. I love knowing that not only my kids are able to learn, but also any children that enter my home having something to stay busy and learn from. Play time should always be easily educational, and there are so many classic toys that can add to that fun. From stacking cubes and shapes below to the fun new take on the rubber ducky in our post, there are tons of amazing options included in our gift guide that are ideal for your kids or friends this year. 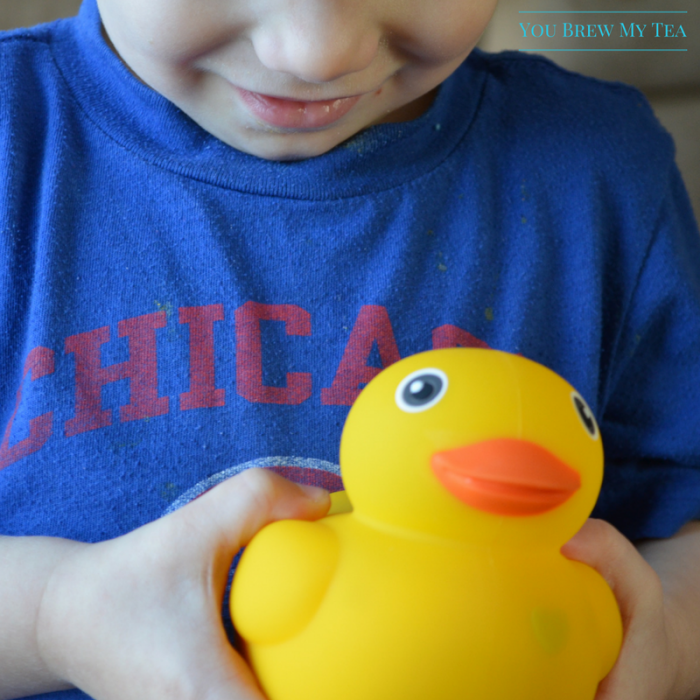 Edwin The Duck – Rubber Duckies are a classic bath time toy, but this new version is an app enabled duck. It acts as a nightlight, and an interactive toy rather than just a simple bath toy. It’s a great option for toddlers and preschoolers. It’s also a fun option for introducing your kids to simple tasks for following directions using a Smartphone and app. My friend Emilee has 4 kids under the age of 6 and had all of them help her review this for us. While her younger ones struggled a bit with the app, the older 2 managed just fine. Overall, however, all of her kids loved the nightlight and the fun duckie. You can learn more about it on their Youtube Channel. Hape Numbers and Colors– These chunky numbers are a fun and bright way to introduce numbers and colors to your child. Buy two sets and they can be used for matching colors or numbers. Hide them in sand or rice in a sensory bin for your child to discover. Shape Cube– Remember the simple old shape sorter of the past? These are still a fantastic tool for your child. Giving them a fun way to learn shapes and problem solve as they work to fit them where they go. Stackable Blocks– Hand-eye coordination, size differentiating, fine motor skills and more are taught through simple play with these stackable blocks. This is one of my favorite learning toys for toddlers since they have some great designs that are excellent for using alongside simple homeschool lessons in a preschool curriculum. Chunky Puzzles– Puzzles are great fine motor practice for little hands- grasping and placing them in the correct spot. Start with simple 4-6 piece puzzles if your child has not worked with puzzles much yet. Pieces with knobs are the least frustrating for a child to use early on. Building Toys– Even at a young age, children can learn so much from LEGO type building toys. This set is even a pull toy for an added bonus. This is a wonderful starter set that can lead to some of our favorite Lego Building Set options when your kids get a bit older. Crayons– These triangular crayons encourage a proper grip, setting them up for greater success later on. Even when they seem to be just randomly scribbling children are working those little minds. I love that crayons really are the original learning toys for toddlers! Everyone has these somewhere in their home! Bath Toys– Learning and development can take place anywhere, even in the tub. My favorite tub toy is a net with fish to catch- it is great for learning colors, hand-eye coordination, fine motor, and most of all just fun play! Balls- Supply them in multiple shapes, sizes, and textures for your child to play. Balls are fabulous for developing gross motor skills, coordination, and other skills. A simple playground ball is a must in your yard, add a few others for variety. I love pulling together great lists of gift ideas and guides that work for any budget. Learning toys for toddlers are what we as parents need for our homeschool classrooms, as well as for gifting around the holidays or birthdays. This list includes some of our favorites. Things that keep your kids happy while you work, as well as learning and growing their skills easily! Don’t forget to check out our other great gift guides below!